The Bolingbrook Babbler: Web Exclusive: Surly Amy goes to Hell! 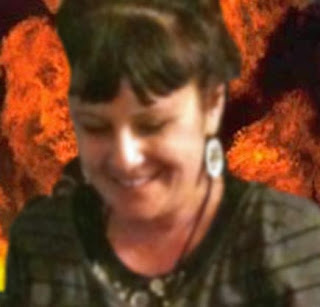 Psychics around the Chicago and Minneapolis area report visions of Skepchick Surly Amy in Hell. Jean, a Minneapolis psychic, said she was on Twitter when she sensed a horrible smell. Don “The Party” Padre, said he sensed a similar sensation while on Twitter. Anastasia Zwada, from Roseville, MN, said claims she had a clearer vision of the Amy’s current fate. Upon hearing the news, Reverend Brian Nowell posted on his blog, “Get out of Hell,” what he called “firm and fair advice” for Amy and her friends on how to get her out of Hell. The reaction from his commenters was quick and harsh. When asked to comment, Skepchick Founder Rebecca Watson, who is at Convergence in Minneapolis, denied that Amy is in Hell. “It sounds like some of your readers took Amy’s Twitter feed and twisted her airport horror story.” Said Watson. In the background, a door opened, followed by a dull thud. A source tells The Babbler that a skeptic ruined a speech about ghost hunting. Sources within the skeptical community say the skeptic might have been under the influence of a “Buzzed Aldrin” which some say is a drug that enhances a skeptic’s anti-psychic energy. When confronted by The Babbler, the skeptic said the reporter should read his blog post about the speech. Then he talked on his cell phone. “Elyse, I’m sorry I forgot to get the T-shirts.” He paused, winced and replied, “Can I wear the dress here? I won’t stand out if I do it here. He paused again. “Not at TAM!” He then wondered off.